Labour governments: more fiscally “conservative” than Conservative ones? The current false “truth” endlessly repeated by those who would benefit from its propagation, and by those who should know better, is that Labour governments are fiscally profligate and/or incompetent compared to other parties' governments. We have therefore looked at the respective records of both Conservative and Labour governments over the recent decades, and find that on several key indicators, including budget deficits and surpluses, Labour governments have been on balance more fiscally “conservative” than Conservative or Conservative-led governments. The financial crisis of 2008/9, with its consequent economic and fiscal fall-out, resulted not from fiscal profligacy but from foolish financial deregulation policies and over-reliance on the finance sector, for which all main political parties were responsible. And while the deficit resulting (and required) to deal with it was the highest as a share of GDP in the post-war period, the economic and fiscal policies of the Conservative-led Coalition also resulted in the slowest economic recovery from recession in that post-war period, allied to a snail-pace deficit reduction rate. Within the UK, since 1972/3 (the start of the dataset) the highest three years for Total Managed Expenditure (TME) as a share of GDP were from 1974/5 to 1976/7. However, Mrs Thatcher’s early governments oversaw the highest sustained 5 year period of public spending as a share of GDP, with public spending that was 46% or more for a record 5 consecutive years, from 1980/81 to 1984/5. As regards UK public sector current spending (i.e. excluding capital spending), the highest figure as a percentage of GDP was 40.4% in 2009/10 under the Brown government. However, the highest sustained period of current spending was under the Thatcher government, from 1981/2 to 1984/5. Her government also saw a higher level of current spending as a share of GDP for 6 consecutive years than in any year of the 1974/9 Labour government. Looking at current budget deficits or surpluses (i.e. excluding public investment), for the period from 1956 to 2008, Conservative governments had an average annual surplus of 0.3% of GDP, while Labour governments had an average annual surplus of 1.1%. For the period starting 1970/1, In the case of Conservative governments, the average annual current deficit for this period is 0.6% of GDP, while for Labour governments over the same period, the average current budget deficit is 0.3% of GDP. Looking at overall budget deficits (i.e. including public investment) for the period 1970/1 to 2008, for Conservative governments, over this period the average annual overall deficit is 2.9% of GDP, while for Labour governments in the same period, the average overall deficit is 2.6% of GDP. Conservative governments, over the period 1971 to 2008, spent a higher percentage of GDP on average on public investment than did Labour governments (this excludes PFI), whether one looks at gross or net investment. Gross investment per year by Conservative governments was on average 5% of GDP, while that by Labour governments it was 4.3%. Taking the period 1974 to 2008, the level of net debt as a share of GDP has fluctuated sharply under both Conservative and Labour governments (with a bigger fall under the 1979-97 Conservative government), but net debt as a percentage of GDP was lower at the end than at the start under each government than at its start, including the 1997 Labour government up till 2008. But once the financial crisis hit, the ratio worsened greatly, so that by the end of the Labour government, the debt to GDP ratio was some 25 percentage points higher than at the outset in 1997. Under the 2010-2015 Coalition government, the debt to GDP ratio rose further by around 18 percentage points. Since 1970, the best average annual unemployment rate was achieved by the Heath Conservative government of 1970/4 with 3.4%, and by far the worst under the 1979/97 Conservative government, with an average annual rate of 9.3%, and exceeding 10% for 6 full years. The 1974/9 Labour government had an average rate of 4.9%, and the 1997-2010 government 5.6%. The 2010-15 Coalition government’s average rate was 7.6%. On the BBC Radio 4 PM news programme last Friday, PRIME’s Ann Pettifor affirmed, in a debate on the “right size” of the state, that Labour governments have generally been more fiscally “conservative” than Conservative governments. David Smith, the Sunday Times’ economics correspondent, asked - fairly enough - on twitter what she meant by this, but seemed not to like the (wholly accurate) response that, for example, Labour governments since 1956 (the start of the ONS database) have on average had lower annual current budget deficits than Conservative governments. A big twitter debate ensued. It seems to us that it is high time – given the relentless and continuing political attacks on Labour’s economic capability – to set the record straight on some key indicators. In fact, current (non-investment) budget deficits are far more a consequence of, and rational response to, financial liberalisation than of economic competence per se - but that's a story for another blog. So here goes! 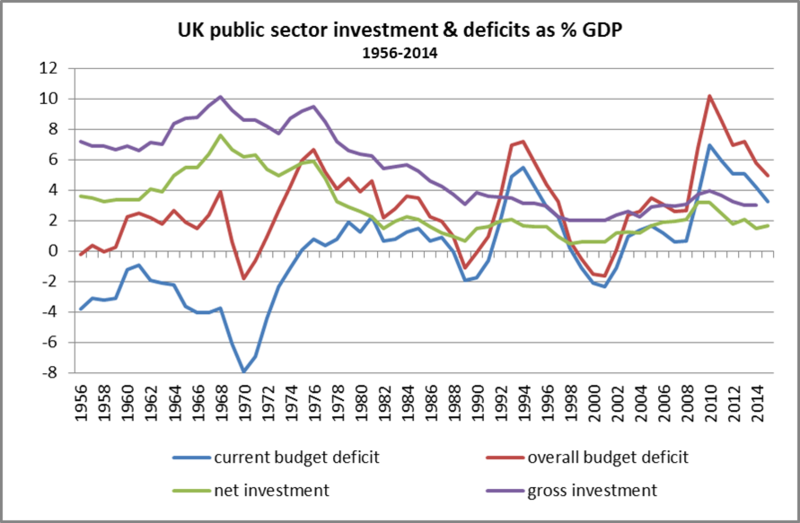 The longer-run level of public spending as a share of GDP is not, within reason, an issue of “fiscal rectitude”. Rather, it reflects the democratic political choices made by a people in a given country. But it is often used as if it were such a test, so we need to look at the true facts. UK public expenditure (as shown by OECD and Eurostat data) is consistently below the EU average as a share of GDP – the list is topped as one would expect by Scandinavian countries but the UK is also below Germany as well as France, for example. We are roughly on a par (on this indicator) with Poland. Within the UK, since 1972/3 the highest three years for Total Managed Expenditure (TME) were from 1974/5 to 1976/7 with 47%, 48.9%and 47.8% before it slipped back to 44.1% in the last year of the Labour government, and to 43.7% in 1979/80. The highest level since then was at the peak of the financial crisis on 2008/10, with TME reaching 45.7% in 2009/10. As regards UK public sector current spending (i.e. excluding capital spending), the highest figure as a percentage of GDP was 40.4% in 2009/10. And Mrs Thatcher’s government had a higher level of current spending as a percentage of GDP for 6 consecutive years, starting in 1981/2, than in any year at all of the Wilson/Callaghan government (highest level, 38.3%). So on the facts, Mrs Thatcher’s early governments were for 5 or 6 years, by a reasonable margin, the highest spending ones of any government (for better or for worse! ), taking both TME and current spending into account, over the whole period to the present. Budget deficits (or surpluses) can be divided in two – (a) the overall deficit, including capital investment spending, and (b) the current budget deficit, before taking account of investment. We would contend that these are certainly indicators of degrees of “fiscal conservatism”, but in normal circumstances, a reasonable level of deficit is either necessary (in the course and aftermath of banking crises and other recessions) or in any event not a problem in itself. This is especially the case if the deficit is smaller as a % of GDP than the rise in GDP itself, since this means that public debt as a percentage of GDP will still be falling. We have previously (here and here) looked at the respective track records of Conservative(-led) and Labour governments in respect of overall and current budget deficits over the last 25 years, showing that the Labour government on average had much lower deficits – even if one excludes the deficits during first 2 years of the 2010 Coalition government from the calculation. Some have argued that the start date may be unfair to the Conservative cause in this comparison, as the period includes the recession of the early 1990s when the Major government saw deficits almost as big as during the great financial crash of 2008/9. So we have looked at longer periods, using ONS datasets. We have looked at the period from 1956 (when the published ONS dataset begins) to 2008, and taken the average current budget deficit or surplus over this period for Conservative and Labour governments respectively. There have of course been many ups and downs, for both Labour and Conservative governments, but long-run current budget deficits/surpluses appear to us to be one reasonable indicator for assessing “fiscal conservatism”, with lower average deficits being seen as more “conservative”. On this indicator, in fact governments of both political parties show a current budget surplus, on average, over the long-run period. This is largely due to the fact that in the more stable (Bretton Woods) era before the 1970s and financial liberalisation, all governments almost always achieved a current surplus (but with high levels of public investment), while surpluses became much rarer in the more volatile post Bretton Woods era of financial deregulation. Conservative governments have an average annual surplus of 0.3% of GDP over the 53 year period to 2008, while Labour governments have an average annual surplus of 1.1%. (If we extend the period to 2015, i.e. to include the financial crisis and its aftermath, the gap would widen further as the Conservative-led coalition government saw large current deficits for 5 years, following very high peak-crisis deficits for 2 years under Labour. However, we feel it is more balanced to exclude the financial crisis data at this point). We have also looked at the position from 1971 to 2008, and find that over this period, both Conservative and Labour governments have run on average a small current budget deficit. In the case of Conservative governments, the average annual current deficit for this period is 0.6% of GDP, while for Labour governments over the same period, the average current budget deficit is 0.3% of GDP. Therefore, looking at this one indicator in isolation, it is fair to say that Labour governments, over many years, have been somewhat more “fiscally conservative” than Conservative governments. We make this point as a matter of fact, not necessarily as our judgment of fiscal wisdom! The overall budget deficit is arguably a less satisfactory indicator of “fiscal conservatism” since it includes borrowing for investment purposes, which may within reasonable bounds be seen as a positive, notably when (like now) long-term interest rates are low. But it still makes for an interesting comparison, given current politically-inspired emphasis on “the deficit” which is normally taken to mean the overall deficit. Here, we have also looked at the data from 1970/1, also up to 2008, i.e. excluding the financial crisis, and taken the average annual overall deficit for Conservative and Labour governments respectively. In the case of Conservative governments, over this period the average annual overall deficit is 2.9% of GDP, while for Labour governments in the same period, the average overall budget deficit is 2.6% of GDP. Therefore, if this is taken as a further indicator of fiscal rectitude or conservatism, it appears that, over time, Conservative governments have been fiscally expansive and less “conservative”. And again, we draw this conclusion as a statistical matter, not a value judgment on the wisdom of economic policy, since UK governments of both persuasions have under-invested in public infrastructure etc. over many years. (As before, if we had continued to calculate the annual average up to 2015, this would have further widened the gap to the detriment of Conservative(-led) governments). We have also examined annual spending as a share of GDP for gross and net (after depreciation) capital spending, also from 1971. Comparisons are more difficult in that there is a secular trend, since the early 1980s, for public capital investment to decline as a proportion of GDP. Thus over the 25 years from 1956 to 1981, gross investment never fell below 6% of GDP, peaking at 10.2% in 1968. But from 1989 on, it has been below 4% per year for each year save 2010, when it touched 4% as part of Labour’s mini-stimulus. To some extent, this decline reflects the privatisation of publicly owned industries and public assets (including housing). Since the mid-1990s, the level of capital spending has been somewhat masked (understated) by the use of PFI contracts by both Conservative and Labour governments, which in our view is an ideological, fiscally damaging and certainly “fiscally un-conservative” form of spending. Below, we reproduce an IFS chart (see Chart 3) from their interesting 2000 publication, “Twenty-five years of falling investment?” which estimates the capital value of PFI contracts at that time. From the statistics, we find that over the period from 1971 to 2008, gross investment per year by Conservative governments was on average 5% of GDP, while that by Labour governments over the same period was 4.3%. This difference is also reflected in net investment; under Conservative governments, on average annual net investment is 2.4% of GDP, while under Labour governments it is 2.2% of GDP. In terms of fiscal conservatism, we would suggest that a positive but not high level of investment funded wholly or almost wholly without recourse to borrowing would be seen as “conservative”. It appears, therefore, that Labour’s record of slightly lower investment funded by slightly lower levels of borrowing (see the section on overall deficits above) means that over time Labour has been somewhat more fiscally conservative in this regard too. Again, this is not a judgment on the wisdom of an economic policy that delivered a low average level of public investment. To pull several of the above strands together, the following chart shows the evolution from 1956 onwards of deficits and investment as shares of GDP (fiscal year ending Q1 of year). Deficits are broken down between current budget deficits and overall deficits, while investment is divided into net and gross. Note that the overall deficit, from 1956 to 1972, remained fairly constant around 0-2% per year (save only in 1969), i.e. well below the annual rate of increase of GDP. This meant that the debt to GDP ratio continued to fall despite the high levels of investment. In the first year of the 1974-9 Labour government, UK net public debt stood at 55.8% of GDP, down from over 200% at the end of the 2nd World War. At the end of 1978/9, net debt was down to 49%, a fall of 6.8%. During Mrs Thatcher’s government, net debt fell steadily, then (during the Lawson boom) rapidly, to a record low of 24.2% of GDP in 1990/91. When the Lawson boom turned to bust, followed by the forced exit from the ERM, the debt to GDP ratio climbed rapidly again till the end of the Major government, when it reached 39.9% of GDP in 1996/7. Under the Blair Brown governments, the debt to GDP ratio first fell back to 29.4%, then rose back to 36.9% in 2007/8 i.e. just before the global financial crash struck. Thus until the financial crisis, debt to GDP under Labour was always lower than the level “inherited” at the end of 18 years of Conservative government. The financial crisis of course changed this dramatically, reaching 49% in 2008/9 and 62.2% by the end of 2009/10. Under the Conservative-Liberal Coalition, it rose to 80.8% of GDP by the end of 2014/5. Under the 1974-79 Labour government, the net debt to GDP ratio in the last year was some 7 percentage points lower than at the start. Under the 1979-97 Conservative government, the debt to GDP ratio was around 16 percentage points lower at the end than at the outset. Under the 1997-2010 Labour government, immediately prior to the global financial crisis in 2007/8, the debt to GDP ratio was 3 percentage points lower than at the outset in 1997. But once the crisis hit, the ratio worsened greatly, so that by the end of the government, the ratio was some 25 percentage points higher than at the outset in 1997. Under the Coalition government, the debt to GDP ratio rose during the 5 years by around 18 percentage points. Looking at annual debt interest payments as a percentage of GDP, these have varied between 1.8% and 4.3%. The highest levels of interest as a percentage of GDP were during Mrs Thatcher’s government, when for 6 consecutive years, interest payments were over 4% of GDP. Therefore, despite the increase in net debt since the financial crisis struck, debt interest payments as a share of GDP have remained at a level that is by no means high in historic terms, and is considerably lower than under Mrs Thatcher’s government (which of course was during a period of generally high interest rates). Unemployment may not be a typically used indicator of fiscal conservatism, but we believe it to be entirely relevant to consideration of the proper conduct and outcome of a well-managed fiscal policy. Maintaining a high level of unemployment for a sustained period may be seen as a sign of long-run fiscal conservatism. The ONS dataset for the annual average unemployment rate commences with 1971, though we have figures for earlier years which tend to be a little lower, and are set out in an ONS publication from 1996, “Unemployment statistics from 1881 to the present day”. Prior to 1970, since the end of the war the unemployment rate was between 1 and 3 per cent, whichever government was in power. Thus, from an unemployment perspective, the worst performing government by far was the Thatcher/Major government, which had unemployment above 10% for 7 of its 18 years. Indeed, 6 of those years of over 10% unemployment were during Mrs Thatcher’s term of office of 11 years; these more or less coincide with (and helped cause) the highest sustained level of public spending (TME) as a percentage of GDP in the post-war era. Under no other post-war government has unemployment exceeded the 8.1% level of 2011. We have looked at the data for GDP from 1956, for the 3 years following any year in which the economy, measured by change in GDP, declined from the previous year. For the 3 years following the 2009/10 crisis, the year on year GDP changes were 1.5%, 2% and 1.2%. Coming out of the 1994 recession, the annual changes were 0.4%, 2.6% and 4%. Following the 1982 recession, the rates were 2.1%, 4.2% and 2.3%. Following the 1976 recession, the rates were 3%, 2.6% and 4.1%. The three years 2011 to 2013 taken together saw the lowest average increase in GDP of any non-recession years since 1956, the nearest being 1957-9 – but in an era of full employment. Comparing the rate of “deficit reduction” under the Coalition government, the current budget deficit declined by just 1.9% over 3 years, from 7% (2010) to 5.1% (in both 2012 and 2013). This compares with a reduction after 1994 from 5.5% to 2.3% after 3 years. The 2010 overall budget deficit declined from 10.2% to 7.2% after 3 years, a fall of 3 percentage points. After 1994, it declined from 7.2% to 3.3% after 3 years, a decline of 3.9%. Compared with the recovery from the 1976 and 1982 recessions, in terms of budget deficits, the Coalition government’s record is hard to compare, since each of the earlier governments started with current budget deficits of under 1% of GDP and did not exceed 2% in the following 3 years, but continued to borrow for investment. It seems fair, therefore, to conclude that in terms of economic recovery after recession, the post-2010 period was the slowest on record, and that the rate of deficit reduction over that period was materially slower than under the Major government post-1994. Fiscal conservatism is a politico-economic philosophy with regard to fiscal policy and the advocating of fiscal responsibility. Fiscal conservatives advocate the avoidance of deficit spending, the reduction of overall government spending and national debt, and ensuring balanced budgets…. Fiscal conservatism is the economic philosophy of prudence in government spending and debt. On this basis, we may conclude that, over many decades, Labour governments have a good claim to be more fiscally conservative than Conservative ones. They have over time maintained a significantly lower average level of annual deficits – whether current budget, or overall budget deficits. In terms of investment spending, and we make this point more in sorrow than joy, Labour governments have on average achieved lower levels than Conservative ones, which may be seen as being more "fiscally conservative". In the whole period since 1956, there have been only 8 years on which an overall budget surplus has been achieved – and 4 of these were under Labour governments, 3 of them being the largest surpluses as a percentage of GDP. Regarding current budget surpluses (of which there have been a few more), 6 out of the top 10 (in terms of scale) were under Labour governments. On levels of public spending (which we do not see as truly being an indicator of fiscal conservatism), the Thatcher Conservative government runs neck and neck with the Wilson-Callaghan one in terms of any 5 year period. Her government for a long period substantially outspent (as a percentage of GDP) the Blair-Brown Labour government. And if the aim of a reasonably prudent (i.e. conservative) fiscal policy is to at least avoid mass unemployment, then the record of Labour governments since 1970 is far better than that of the Thatcher-Major government which oversaw extraordinarily high levels of unemployment - despite being the beneficiaries of North Sea Oil and Gas as they came on stream in large quantities. We cannot however overlook the financial crisis (which hit the UK exceptionally hard due to excessive levels of private debt); and the fact that the budget deficit that resulted was the largest in the post-war period. The size of the deficit at its peak in 2010 – greater than almost all other countries – was not to there being a high level of public debt (there wasn’t – it was under 40% of GDP), nor to any large-scale budget deficit in the lead-up to the crisis (there wasn’t). The crisis, and its deficit, were due to the structural imbalances in the UK economy, especially its excessive reliance on banking and financial services (and other related services). That imbalance, and the lack of regulation of the finance sector, is a factor common to both Labour and Conservative governments and parties in the decades leading up to the 2008/9 crisis. Yet the current Conservative government is in the process of making the same mistakes again, giving ever more “freedom” to the banking and finance sector to speculate, while manufacturing industry stagnates, exports fail to take off, and support for non-oil industries and technologies is removed. The failure of successive UK governments since the early 1970s is therefore not so much in terms of fiscal conservatism or otherwise, but of failure to regulate and manage the finance and banking sectors in an age of excessive private debt and deregulation of capital flows. In short, a failure of overall strategic economic policy rather than fiscal policy. Reminder - it is employment and economic activity that matter! This rather long article has sought to compare and contrast the fiscal records of Conservative and Labour governments in the hope that we can reach fairer and more balanced judgments than the current biased political discourse allows. Even if you take the Budget as your test, the criterion of whether the economy would be useful or not is the state of employment…I do not believe that measures which truly enrich the country will injure the public credit…It is the burden of unemployment and the decline in the national income which are upsetting the Budget. Look after the unemployment, and the Budget will look after itself. I would just add that today, it is not only about employment but – in an age of casualised, fragmented and often partial employment, about decent employment at decent rates of pay. We have seen real wages decline by some 8% in real terms since the crisis, only recently mending. In the past, we have managed successfully with unemployment rates under 3%. Inflation is non-existent and interest rates historically very low, so we have plenty of space to increase economic activity, employment and investment – and the public budget will look after itself. The data, almost all from ONS sources, used in this article are set out in the attached pdf table. The year referred to is for most datasets the end of the fiscal year i.e. reference to 1956 (the first year) is toi 1955/6. But, for some datasets (unemployment, GDP) the information easily accessible is in calendar years. Therefore any comparisons between or across the datasets may not be perfectly correlated. However, any inconsistencies are marginal.